With today's busy and demanding schedules, we all need God's Word wherever we go! This little book is filled with personalised, Scripture-based confessions for health and healing and for finances. Readers can now arm themselves with the Word of God to win life's battles. The Scripture Confessions Series connects the reader to the timeless passages in God's Word that speak to the issues of most concern to them. More than just a book of prayers, the reader will find personalized confessions that will strengthen them with God's Word to overcome every adversity. This unique collection of Scriptures is a must have for readers on the go. Whether at work or home, readers can access Scripture Confessions and remind themselves of God's faithful promises, in all areas including healing, finances, protection, wisdom, and more! 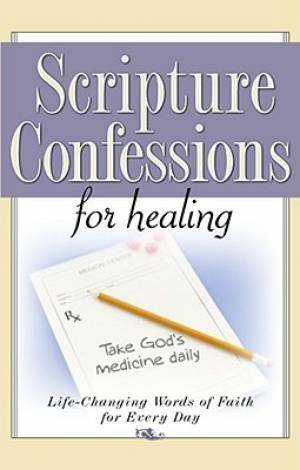 Scripture Confessions For Healing by Harrison House was published by Nova Publishing in July 2007 and is our 13074th best seller. The ISBN for Scripture Confessions For Healing is 9781577948735. Be the first to review Scripture Confessions For Healing! Got a question? No problem! Just click here to ask us about Scripture Confessions For Healing.